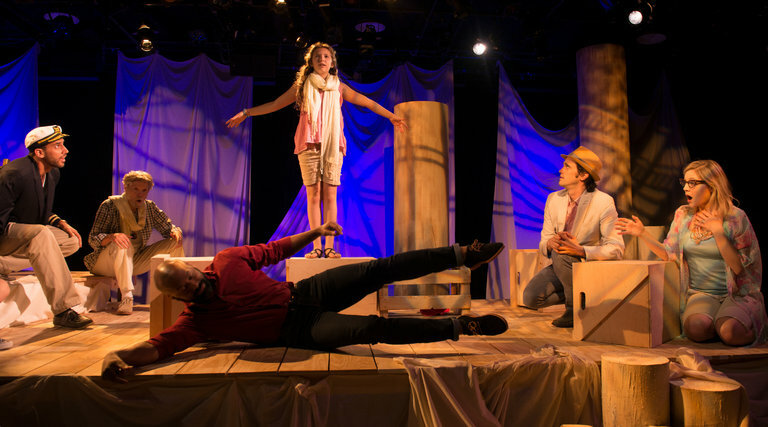 Theater in the Now: Review: Are We Ready for the Storm? Review: Are We Ready for the Storm? Theatre 167 presents Tina Howe’s new play Singing Beach at HERE. Ari Laura Kreith directs. You still have a few more summer days to catch this beach play. The residents of Singing Beach on the North Shore of Massachusetts are warned that Hurricane Cassandra will soon be close enough to do damage to their community. Like the Cassandra of Greek mythology, the storm speaks of an inconvenient truth (in this case, Global Warming). The question is, who in the world is listening to the warnings and what will they do next? Residents are advised to evacuate, but we see many people hoarding supplies and preparing to stay in their homes and wait out the storm. The tension between staying put and going away informs much of the rest of the interesting, dreamlike story. Piper (Elodie Lucinda Morss) is a young girl who is first seen at the beach using a video camera. Her brother, Tyler (Jackson Demott Hill) teases Piper while knowing that Piper’s teacher, Miss Blake, has been making the school aware of climate change and has inspired Piper to think of how she could survive in the desert with the Bedouins. Their mother, Merrie (Erin Beirnard) and step-father, Owen (John P. Keller) are facing the difficult choice of placing Grandpa (Tuck Milligan) in a nursing home. Grandpa currently has a live-in caregiver, Bennie (Naren Weiss), but his situation has deteriorated. Merrie once wrote a novel called “To Let: Narrow Room For Quiet People”. When Piper finds out about Grandpa’s upcoming move to the nursing home—which is delayed by the storm—she hides away in her room and uses a knife once given to her by her absentee father to whittle a wooden ocean liner. Tyler, Merrie and Owen are all dealing with their frustration about Grandpa in different ways; the people most interested in Piper’s feelings are Grandpa (who has lost the ability to communicate verbally but gives good hugs) and Bennie. Bennie says he is going to perform in a community theater production of Gilbert and Sullivan’s Ruddigore (fans may think of the aria “My Eyes Are Fully Open To My Awful Situation”). As the storm hits, Merrie retreats into her fantasy world of the ocean liner. The Captain of the vessel looks a lot like Bennie. Also on board is the charming and powerful teacher, Miss Blake (Erin Beinard), young stowaway Credo (Jackson Demott Hill) and Gabriel (Devin Haqq), the host of Merrie’s favorite TV show, “Mental States”. Could the biggest celebrity on the fantasy craft be Piper’s father, Sebastian (John P. Keller) who is a renowned artist in London? It just so happens that Sebastian is transporting 2,000 kilos of nylon tent fabric over to his latest art exhibition. Also to Piper’s delight, Grandpa is on board and he is able to walk and talk. The Captain catches Credo the stowaway but instead of punishing him gives his own cabin and rewards him for taking the initiative to go and see the world. Clearly, the path to success in this tale is going away from a rigid, untenable worldview and lifestyle. As the toy craft goes through its own storm (see: poster for the current production), the passengers use the tent material for shelter and sing a rousing chorus from Gilbert and Sullivan’s H.M.S. Pinafore. Throughout, Piper finds her voice in a way that she is not allowed to back home. Finally, the storm is over. Of the residents who stayed, or couldn’t flee, many have died. The time has come to take Grandpa to the nursing home. However, Piper may have other ideas. Singing Beach itself begins to sing in a joyous, cosmic way. Jenn Price Fick’s set is a beautiful place to experience this story. Sections of logs are arranged on several levels and painted white, a convenient setup which transforms into the ocean liner. White cloth stands in for the sandy beach, and for the tents and sails that come out during the storm. Add Matthew J. Fick’s lighting, and the result can be positively haunting. As the cast reference some great poems (Miss Blake is several times compared to William Blake’s “The Tyger” and on the ship we hear of the “Rime of the Ancient Mariner” and see Piper ready to transform into a mighty bird) we are reminded of the destructive power of nature but also of humanity’s ability to make a positive impact. All it takes is a sensitivity to new ways to adapt and survive. As the world tries to survive the current President of the U.S.A., we should abandon our narrow rooms and ideas and strive for positive change. Not just those who live by the water, but all of us. Director Ari Laura Kreith takes the characters on an unexpectedly intricate journey. Elodie Lucinda Morss, the youngest performer, carries much of the play. For me, her transformation into a defiant leader is the most striking moment. Erin Beinard, Jackson Demott Hill, John P. Keller and Naren Weiss show great versatility in their frequent transformations between the world of Massachusetts and the world of the imagination. Tuck Milligan (Grandpa, also known as the “Sleeper”) shows us what we can hear if we truly listen.